The Cuisinart DTC-975BKN is a high tech coffee maker that consistently brews great coffee. It features a thermal carafe which makes it ideal for long Sunday mornings or when you are entertaining guests. 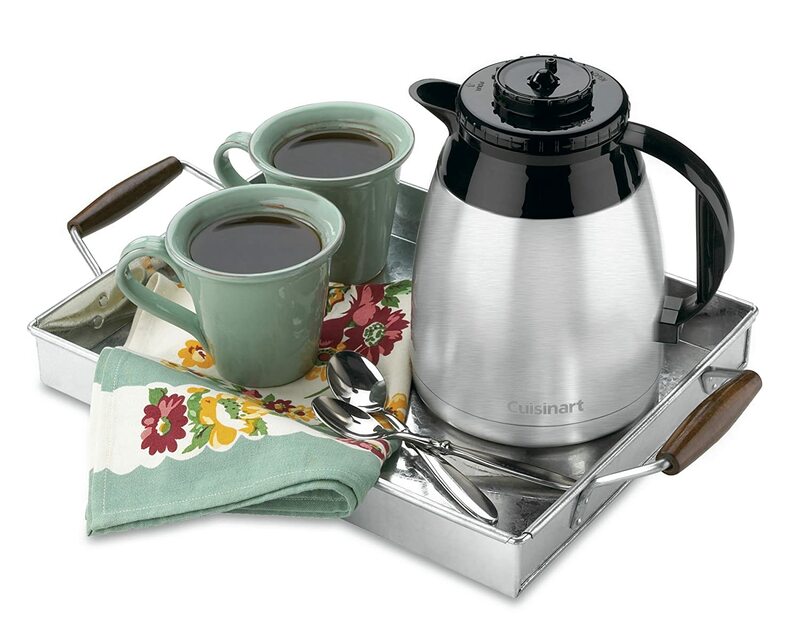 The Cuisinart DTC-975BKN features a stainless steel thermal carafe and that is the secret to it’s great coffee. Heater plates used to keep coffee in glass carafe’s hot ruins the coffee because it doesn’t taste fresh at all. This coffee maker does not even feature a heater plate because the thermal carafe does all the work. The coffee stays steaming for hours making it ideal for those mornings when you have time for a third or fourth cup. When you have guests over, a thermal carafe is also very useful because the coffee tastes as good as it did when it was first brewed. Not to mention, it’s a 12 cup carafe which makes it one of the bigger carafe’s available. Enjoy cup after cup of steaming hot coffee without having to brew over and over again! The carafe’s lid was also designed well as you don’t ever really need to remove it which helps to preserve the heat inside it. The lid features a “open” “close” and “pour” setting so do make sure you are using the right setting to avoid a mess. We have come to expect much more than just good coffee from our coffee makers and the Cuisinart DTC-975BKN definitely takes that to heart. Features such as the brew pause function makes live easier, just push the button and sneak a cup right in the middle of the brew process. The Cuisinart DTC-975BKN also has a programmable start time so that you can wake up to the smell of hot coffee every morning. Slept in a little? no problem, the carafe will keep it nice and hot for you. Obviously, as a safety measure, the coffee maker has an auto off function for safety but also to preserve energy. Another great thing about the Cuisinart DTC-975BKN is that the designers thought about the little things as well. For one, the machine makes an audible beep when the coffee is done dripping so that, even if you are in another room, you know when its ready. The featured water level indicator is also a little thing but you would be surprised as to how many simply forget to add it. An instruction booklet, a long lost art, is also included to help you with the setting of the clock and programming of the auto-on function. Moreover, unlike many other models, Cuisinart offers a 3 year warranty on this coffee maker which shows their confidence in the product’s durability. The Cuisinart DTC-975BKN is unique because of the amount of coffee it brews in one go and how long it keeps this coffee scolding hot. I repeat once again, just simply perfect if you are having some guests over for coffee. No need for half cups while everyone waits for a fresh batch. The features really do make life easier and if you have never used them before you will love them in no time. I can highly recommend the Cuisinart DTC-975BKN to any coffee drinker out there.